Building a house from the ground up gave us a lot of time to think about and plan for incorporating the best green technologies in the market. From our wood siding and drywall choices to furniture, tile, and lighting, , sustainability was a top priority during the design and construction process. However, we understand that when you’ve already purchased a house, it probably was not built specifically with green features in mind, which means if you want to live more “sustainably”, you might be thinking about ways to adapt or replace the features in your home. Good news! Enable is equipped with a number of features that could also be used in existing homes, without requiring an entire remodel. Here are some ideas for ways to make your home a more energy-efficient, environmentally-friendly, and healthier place to live – on a scale as large as you want. Solar panels. In our blog about sustainability, we tackled the myth that solar panels are eye-sores. As you have seen with Enable, solar panels today can look much like normal roofing materials and last just as long. If your roof is due for a replacement or repair, consider doing it with solar panels. Our roof-integrated solar panels allow Enable to be net positive – the house produces more energy than it consumes – which eliminates energy bills! Heat pump. According to Energy Star, maintaining a home’s indoor temperature can use up to half of your home’s energy, meaning green tech is a great way to dramatically reduce your energy bill – and carbon footprint! In a typical home, separate systems are used for heating and cooling. Enable will use an air-source heat pump to heat – including water – cool, and control the relative humidity of the home, which helps make Enable 90% more efficient than the average home in our community. Rain barrels. Outdoor water use, like watering plants, is a major factor in your home’s overall water usage. That’s why Enable waters its plants using rainwater caught by barrels connected to roof gutters. Installing a rainwater catchment system at your home can enable you to easily water all your plants after even just a ⅛” rainfall, entirely eliminating the need to use purified water from the house. WaterSense appliances. If you’re not making any major design changes in your house, upgrading to WaterSense appliances is an easy way to reduce your water usage. WaterSense is a U.S. Environmental Protection Agency (EPA) program designed to encourage water efficiency. Enable’s WaterSense labeled showerheads and toilets allow our appliances to collectively use ~30% less water than those in a standard, code-compliant house. Energy Star appliances. Buying appliances certified by Energy Star, an EPA/DOE program that rates appliances for energy use, is another easy and effective way to transform your home into a more energy-efficient space. Enable’s appliances, such as our dishwasher, our washing machine, and our refrigerator, are supplied by Beko, the 2017 Energy Star Partner of the Year. Smart home features. One of the best ways to conserve energy is to find out where you’re using the most power. 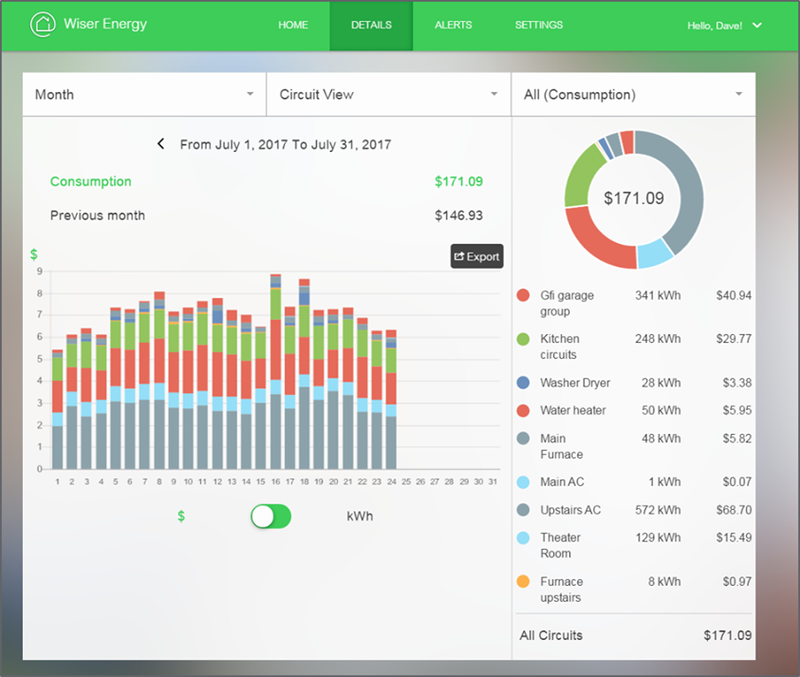 Enable uses the Wiser Energy Center, which monitors the amount of energy is being used by each outlet, and can send this data right to your smartphone. Using other smart home devices, like those which can program your thermostats and lighting or monitor the air quality of your home, are other easy-to-install home improvement solutions. PURETi. Enable is one of the first residential homes to use PURETi, a water-based (NSF and NIOSH approved) spray coating that is photocatalytic and is applied to windows and exterior surfaces of the house. When light energizes a PURETi treated window, wall or solar panel; oxygen and water in the air (humidity) are activated to instantly break down organic grime on the surface and pollution in the air thus transforming treated surfaces into light activated, self-cleaning air purifiers through a proven and well studied technology known as photocatalysis - the safe reversal of photosynthesis. As our house has continued to take shape more and and more each day, its personality has emerged. With the walls up and solar panels and windows installed, the House by Northwestern team is ready to announce the name of our house. Introducing Enable: Your home for today, and tomorrow. Enable is the sum of two of our core tenets: ENergized, which refers both to energy-efficiency and an active lifestyle, and AdaptABLE, which means this is a house that can fit many roles and changes with residents as they change. The word by itself, Enable, describes the role we envision our house playing in a resident’s life. Our target demographic is between the ages of 55 and 70 and includes people who want to spend the rest of their lives in their homes. Aging is sometimes thought of negatively and in conjunction with challenges like reduced mobility, instead of considering the unique advantages to this age group like increased flexibility in lifestyle. By calling our home Enable, House by Northwestern emphasizes the ways in which our house enables its residents to live their lives to the fullest. Because Enable is both low-maintenance and meets the accessibility guidelines of the Americans with Disabilities Act, it meets the needs of its residents in the present and future. And because we care about what the earth will look like tomorrow, Enable uses the best green technology on the market to reflect House by Northwestern’s values and be as environmentally friendly as possible. In the earlier years of living in Enable, residents like Michael and Lisa will value the way their house complements their energy-infused lifestyle as they travel more and host gatherings with friends and families. Later, their house can adapt into a space that accommodates Michael and Lisa in their old age, whether that means it includes space for an in-home caretaker or for a wheelchair to move freely around the house. Whatever Michael and Lisa’s needs, our house is enabled to meet them. The communications team at HBN really hates the word “sustainability.” You can find about a million definitions of “sustainability” online, and not one of them is the same. That probably explains some of the negative baggage associated with the word. We often use alternatives to the word for this reason, but because it is such a prevalent concept in the green industry, it would be foolish to avoid it altogether. In addition to defining what it means to us, we hope in this week’s blog post to change some of the definitions and assumptions that are often held about sustainability. While there is no one definition that can encompass all that the overused and misunderstood word means, we like the definition produced by the Brundtland Report, which says it “meets the needs of the present without compromising the ability of future generations to meet their own needs.” This concept is important to us because we care about the future of our planet and ways we can use technology and renewable energy to make residents and the earth healthier. Before joining the HBN team, though, we thought a lot of things about sustainability that we now have realized aren’t true. While the upfront cost of much of green technology – like solar panels or electric cars – can be 10-15% more than conventional materials, using renewable resources pays off very quickly. On average, solar panels in the U.S. pay for themselves in just 7.5 years according to EnergySage. And that’s without taking into account gas money that could be saved if the panels are also used to power an electric vehicle, as is the case for House by Northwestern. Being sustainable doesn’t mean only showering once a week or living in a treehouse, nor is “sustainable” synonymous with “green.” Although there’s a fair amount of overlap between the terms, “green” usually suggests a preference for the natural over the artificial. However, with the Earth’s population, it would be impossible to expect a high standard of living without a dependence on technology. Electric cars, wind turbines and solar cells are the antithesis of natural—but they allow people to get around, warm their houses and cook their food with renewable resources that aren’t bad for the planet. There are plenty of features you can add to your house that aren’t even noticeable. House by Northwestern is a great example of how new technology has made practicing sustainability much easier. Our solar panels are roof-integrated, which means they last as long as roofing and can be installed by roofers, too. We also use a heat pump, which both heats and cools our home by moving around heat energy. Improving air conditioning systems saves energy costs and also could eliminate a full degree Celsius of warming by 2100 according to the New York Times. These are just two examples of ways our residents will enjoy the benefits of more environmentally-friendly practices without needing to sacrifice how their house looks. Of course recycling is important: reusing metals, paper, wood and plastics rather than tossing them reduces the need to extract raw materials from the ground, forests and fossil-fuel deposits. More efficient use of pretty much anything is a step in the direction of sustainability. But it is just a piece of the puzzle, and to think you are living sustainably just because you recycle isn’t fair. Sustainability isn’t black and white: a product or person isn’t either sustainable or not. You cannot really declare any practice “sustainable” until you have done a complete life-cycle analysis of its environmental costs. It has taken us almost two years to create a house with products we know are sustainable. Many of our materials use recycled materials and come with entire life-cycle analyses. Living sustainably requires tons of thought on an ongoing basis. And realistically, you’ll never be able to entirely eliminate your carbon footprint. But you do have the power to do your part to reduce it. Evanston community members joined HBN during its groundbreaking. Vivien Ng, far left, conducted user research with many of the pictured individuals, members of the Osher Lifelong Learning Institute, to develop a persona our target customers. We’ve pictured a very specific demographic living in our home since we first pitched House by Northwestern to the Solar Decathlon in 2015, and this vision has informed every step of our design process. More than being the most energy-efficient building on Northwestern’s campus and one of the most energy-efficient homes in Evanston, HBN will ultimately be a home to a very real family. We want to take this opportunity to formally introduce you to the people who (though fictional) we created using findings and evidence from our extensive user research and who represent the potential future occupants of our home after the competition. Meet Michael and Lisa, a recent empty-nester couple who has lived in Evanston, the city just north of Chicago, for their entire married life. Michael is 55 and Lisa is 53, and both are at the later end of the Baby Boomer generation. They have two children: one is in college, and the other lives with his fiancé in St. Louis. Michael works at a banking firm in Chicago and commutes downtown every day. Lisa is a graphic designer and generally works from home. They both expect to retire in 10 to 15 years. Since their children have left the house, Michael and Lisa have been thinking about downsizing and are looking for a smaller home in Evanston. They want a house that’s easy to maintain, comfortable, versatile and a place they could see themselves living in for the rest of their lives. It needs to be something that can accommodate their current, very active lifestyles: a place they won’t worry about maintaining as they travel more, a place that has space to host dinner parties and holiday gatherings, a house that allows for cooking, gardening and other projects… But both also know they need a place they can call home when age catches up to them resulting in changes to their mobility and activity. Both Michael and Lisa have had to take care of parents late in life, and want a home that is “future proof” and secure for them as they themselves age. After Lisa’s mom broke her hip in her late 70’s while living alone in her large house, she moved into a retirement community. While her mother has liked the support she receives in the home, Lisa does not like the idea of moving into one herself and has noticed her mother is much less active. When Michael’s parents got older and his dad began displaying signs of dementia, Michael’s parents moved in with the family until his father’s death a few years ago. Knowing this, Michael and Lisa hope to find a home that can also accommodate a wheelchair or a potential live-in caretaker. In their search, they haven’t found anything that fits this need – many homes in Evanston are very old and large and require significant maintenance. In fact, this problem isn’t unique to Michael and Lisa – only about 1 percent of the U.S. housing market is suitable for people to age in place – the other 99% lacks accessibility features. That’s where HBN comes in. Our home has everything Michael and Lisa need – from special night lights to prevent falls to grab bars that look like typical towel racks, the couple will be able to age in a place that doesn’t feel any different from a home they’d live in as active middle-aged adults. Michael and Lisa have finally found a home that doesn’t force them to adjust their needs to fit the house but rather is designed to accommodate them.